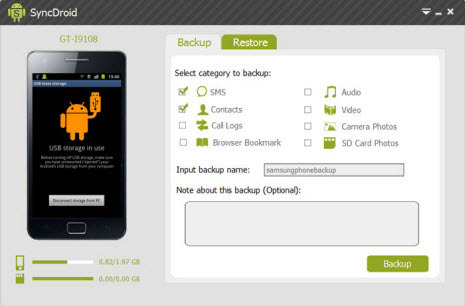 Backup and restore SMS, Contacts, Call Logs, Bookmarks, Audio, Videos, Photos between Android phone and PC. Free, Clean & Easy-to-use SyncDroid Manager ! SyncDroid Android Management would be the best and easiest backup and restore solution for Android. All Android users can use the free SyncDroid to backup and sync Android photos, videos, audio, ringtones, bookmarks or other files on and off Android, all just with a few clicks. Not only backup the photos on Android camera, but also detect the photos in your Android SD card for backing up. So you don't need to worry about lossing any of your photos on the go. Free SyncDroid is an easy way to transfer the following files from your Android Phone to computer: SMS, contacts, call logs, bookmarks and ohter items through the USB cable. Losing or breaking your phone doesn't mean you have to lose all your data. SyncDroid is a free Android Backup & Restore tool that makes a secure backup of all the following items in the device, so you can easily restore them to any Android device whenever you like. Just only 3 steps to backup your Android contacts, messages, call history to computer, or restore them to your Android device. Turn on the USB Debugging on your Android Phone first, then connect it to a computer or laptop via a USB cable, and the SyncDroid will detect the device automatically and install driver needed. Quick, free, safe and security fixes make SyncDroid the best Android Manager. No installation on Android Phone required. Turn on the USB Debugging on your Android Phone first, then connect it to a computer or laptop via a USB cable, and the SyncDroid will detect the device automatically and install driver needed. 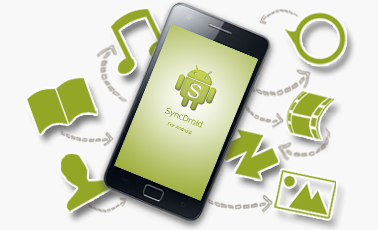 SyncDroid Android Management would be the best and easiest backup and restore solution between Android & PC. SyncDroid is what you need to back up everything whenever you want and restore your files to the same device or a new one with just a few clicks. Simply download and have a try.